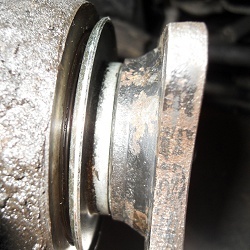 There are lots of different Pinion flanges fitted to the different differentials and axles of Land Rovers. Some of the pinion flanges are compatible with different oil seals and some aren't. 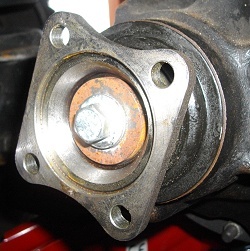 Flanges usually have mudshields fitted and this is mostly what dictates the type of oil seal. 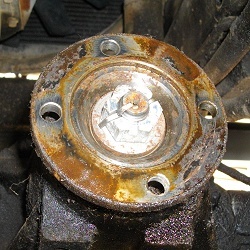 Discoveries have 3 bolt flanges due to having a rubber donut joining to the propshaft and Defenders have 4 bolt flanges. See the front axle flanges, rear axle flanges and whether they attach with a nut or a bolt. If you are replacing the seal and flange together, then you can order a flange kit. STC3722 has the FRC3002 square type flange (49mm long); STC4858 is the round (61mm long) flange, which is only available as part of a kit. They are relatively interchangeable when fitting the whole kit (see below). When replacing STC3722 (or FRC3002) with STC4858, you will need to remove the spacer around the pinion (right image below), otherwise the newer flange won't go deep enough. 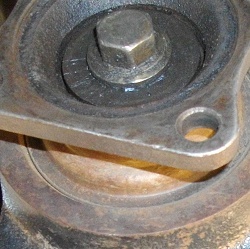 These flanges are also found on the rear differentials	of Defender 90 vehicles. You can detect the type of flange you have by its shape (as above). The mudshield will tell you what type of seal you have. FRC8154 sits proud of the casing and uses the seal FRC8220 (left image below); the newer FTC5317 sits recessed in the pinion housing and is much more successful at protecting the seal FTC5258 (right image below). 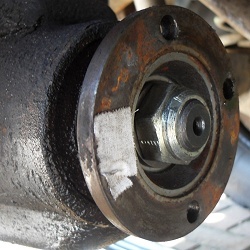 The Rover axle as fitted to 90s is the same as the front axle pinion (above). The Salisbury and short nose P38 pinion flanges are quite different. The P38 axle flange is a cross between the older square and newer round flanges of the front axle; it has a square shape like the flange from STC3722 and is longer like the flange from STC4858. As such, it isn't interchangeable with the front diff. It is also only available as part of the kit STC3124. 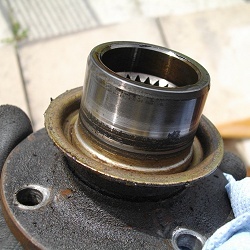 The oil seal FTC4851 is also different to the front differential oil seal. 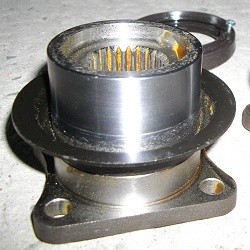 The Salisbury axle flange has two kits available STC4457 and STC4403, which both have a rubber seal upgrading over the earlier leather seal AEU2515 found with flange 607185. The earlier and later flanges both work with both types of seal, but to be effective they should be a matched pair, because the later rubber seal STC4401 has an extra lip that combines with the mudshield to give superior sealing. There is also an alternative rubber version of the earlier leather seal AAU3381. See the table below for clarification. 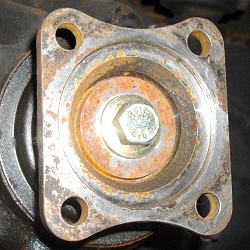 The only similarity between the P38 short nose and front/rear Rover differential pinion flanges is that they share the same mudshield FTC5317. 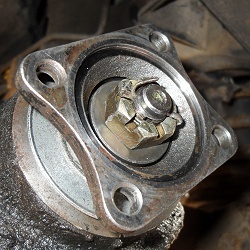 However, instead of being recessed on the front diff housing, it sits flush with the end of it. 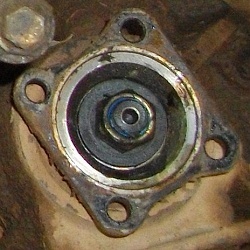 The Salisbury axle has a flange that should have the mudshield already attached, so it isn't available as a separate part number. 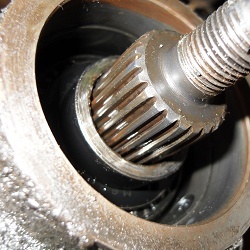 The fixing method depends on the pinion shaft fitted in the differential, so each type of pinion flange could be fitted with any of these methods. 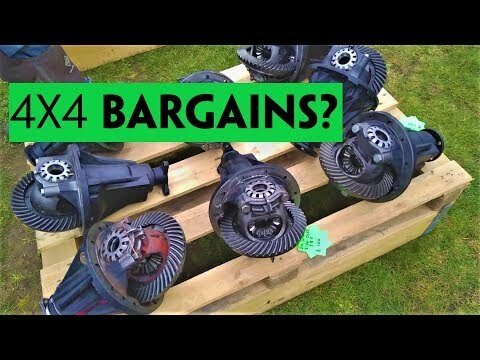 The only way to know is to remove your propshaft. 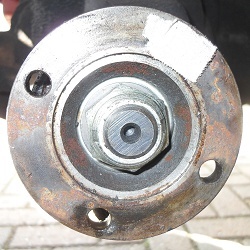 When buying a flange kit, such as STC3722, it will come with a selection of nuts/bolt to account for this. Salisbury axles all have a nut 90608545 and washer 607357.